The first 720S Track Theme, commissioned by McLaren Manchester, features an Anniversary White paint job inspired by the automaker’s Formula 1 cars of the 1980s. The exterior also features black and orange accents on the doors, rear, and hood. The black wheels feature orange on the outer rim, and the “Speedy Kiwi” design on the mirror caps further celebrates McLaren’s racing heritage. To save weight, all carbon-fiber components have a satin finish instead of paint. Inside, you’ll find black Alcantara upholstery with orange contrast stitching. Bred for the track, this car has a lightweight titanium harness bar that can be fitted with a six-point harness. As you may have guessed, the 720S Pacific Theme is inspired by the ocean bearing the same name. It features a Cerulean Blue paint job accented with a darker shade called Estoril Blue on the door intakes. Carbon-fiber components on the roof, air intakes, front splitter, mirror casings, rear diffuser, rear deck, and rear bumper are tinted in a third shade: Cobalt Blue. More blue can be found on the seats and steering wheel. 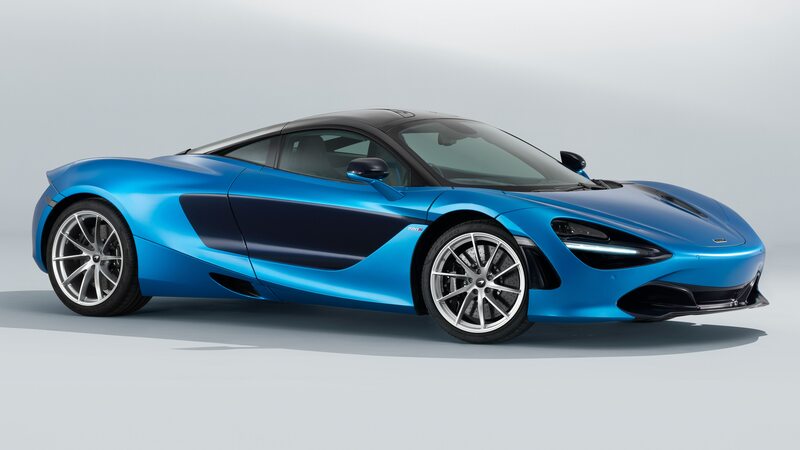 If this isn’t your shade of blue, MSO also presented a darker 720S in Atlantic Blue earlier this year.